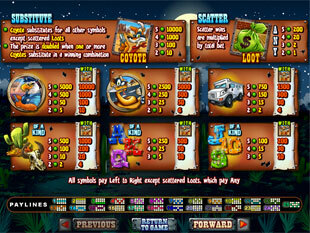 Coyote Cash Slots is a 5 reel 25 lines game presented by Realtime Gaming. Based on the robbers from the Wild West theme this game offers you to win the top jackpot of 10,000 coins during main game and up to 40,000 coins during bonus spins. Such features as wild multiplier, Free Spins and random progressive jackpot make this game really exciting. Enjoy the Western desert that is displayed as the background of this slot. Funny and courageous heroes of this game bring you a good mood as well as great prizes. 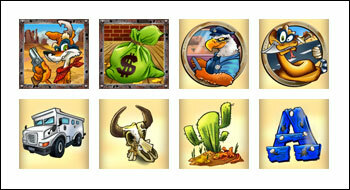 The symbols represented are Coyote, Loot, Snake, Bull Skull, Armored Bank Car, Eagle, Cactus, Ace, King, Queen, Jack, Ten, Nine. Just hit Coyote or Loot in a winning combination and enjoy the excellent animation in conjunction with amusing sound effects. You can choose among such coin sizes as $0.01, $0.02, $0.03, $0.04, $0.05, $0.06, $0.07, $0.08, $0.09, $0.1, $0.25, $0.5, $1, $2.50, $5.00. The minimum bet to cover all 25 lines is $0.25 only. Thus, you have the opportunity to have more chances to win the prize spending less money. On the other hand, the maximum bet is $125. Just choose the best for you. The highest jackpot is 10,000 coins or $50,000 for 5 Coyotes or for 4 Eagles with 1 Coyote. The second jackpot is 5,000 coins or $25,000 for 5 Eagles or for 4 Snakes with 1 Coyote. The third highest jackpot is 2,500 coins or $12,500 for 5 Snakes. The wild symbol of this game is the Coyote. It can substitute any other icon except the scatter to complete the winning combination for you. Moreover, it also doubles your prizes. Thus, you will get 5,000 coins or $25,000 for 4 Snakes with 1 Coyote instead of 2,500 coins or $12,500 for 5 Snakes. This funny animal can be really generous. The Loot is the scatter symbol. Money makes money and this time such a rule really works. Hit 2, 3, 4 or 5 Loot on the reels and multiply your total bet by 1, 2, 20 or 200 times accordingly. In other words, you can win up to $25,000 per spin if bet maximum $125. Free Spins. Get three or more scatters and win 20 Free Spins. The other good news is that you are also awarded with the multiplier that depends on the number of scatters you hit. Thus, for 3, 4 or 5 Loot your prizes during Free Spins will be multiplied by 2, 3 or 4 respectively. This feature can bring you 40,000 coins or $200,000! The random progressive jackpot is another nice addition that can bring you good money. It can be won after any spin at random. Look at its ticker above the reels to find out how much your prize can be. You need to do nothing. Just enjoy your game and maybe you will be lucky enough to get this prize. 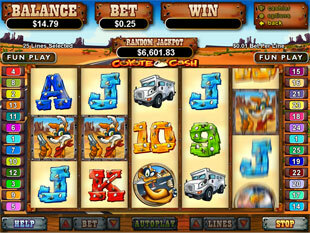 Coyote Cash slot machine is a very amusing game with incredible prizes up to 40,000 coins or $200,000. Excellent animation and funny heroes in conjunction with such extra bonuses as Free Spins and multipliers make this slot really entertaining and absorbing.